The design and quality of a VHF marine radio’s antenna can have a considerable impact on its abilities. The antennas height, shape and placement affect the radio’s range and transmission capabilities. Even the most superior marine radios can’t perform effectively without a top-notch, well-constructed antenna. Many people obtain radios with cutting-edge features and upgrades which is great, but the second step is to ensure that its antenna is able to perform as well as the innovative extras. Owners may attribute a bad signal to radio malfunction or poor internal components, when the issue actually has to do with the antenna. If you are considering obtaining a VHF Marine radio, then read on, as this article will provide you with all the information you need regarding the 5 best VHF marine radio antennas available on the market. Likewise, if you own a radio already, and it’s causing you trouble, maybe it’s time to look into one of these. With that said, let’s get right into it. If you are looking for a good VHF marine radio antenna, then read on as we discuss the features of some of the best marine radio antennas on the market in the VHF radio antenna reviews below. Apart from revolutionary extra features, the Manta 6 is also the most trustworthy marine radio antenna out there. It has been constructed with every aspect of effective functionality accounted for. The Manta 6 has been shown to outclass standard 54 inch and 3dB gain antennas. It is built from stainless steel for ultimate resilience, and yet is slim and lightweight. Adding to its sturdy design are the soldered connections, “O”-ring weather seal and UV resistant cap. That’s just the start, as performance-wise the Manta 6 excels in its capacities. It has a power rating of 250 Watts, as well as a 1/2 wave length-shunt fed. It is so competent, that it is actually used by the US Coast Guard for search and rescue missions. Other additional features of the Manta 6 include; lighting protection, compression whip retainer and an SO-329 connector. This beauty of an antenna outshines the rest considerably. You simply can’t go wrong with the Manta 6, so look into it. The Shakespeare 5101 Centennial is a VHF antenna that sports a huge, extended 8 foot antenna allowing for optimal range capabilities. It has a chrome-plated brass ferrule with a 1 inch to 14 thread mount to keep it securely in place. A significant increase in signal strength is achieved by its 6dB gain, which is ideal for an antenna of its size. Complementing this are brass and copper components which guarantee top quality. There is a 15 foot RG-cable as well as a PL-259 connector included, both valuable extras. The Shakespeare 5101 Centennial is an excellent choice for all VHF marine radio users and a wise purchase. There was no way that this pearl of an antenna wouldn’t be included, and it rightfully earns its spot on this list. 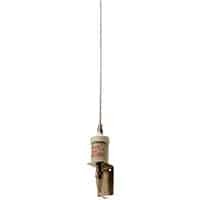 The TRAM 1600-HC is a superbly built, 35 inch stainless steel whip-style antenna that magnifies marine radio functions. The TRAM 1600-HC boasts a gain of 6dB and has the ability to cover all marine band frequencies. This guarantees that no matter where you are on the ocean, you will be able to reach out to everyone, especially in times of emergencies. The TRAM 1600-HC 35-Inch also contains a handy base-loading coil, as well as a highly durable stainless steel L-bracket for side or mast mounting. You simply can’t go wrong by fitting your marine radio with one of these. TRAM makes another entry on this list with the superior 1610-HC 5-Ft antenna. This first-class antenna is highly-durable and made from tough fiberglass for heavy-duty use. Therefore, irrespective of the weather, it will hold out and function proficiently. The TRAM 1610-HC is also able to cover all marine band frequencies, just like the 35-inch version, and has a gain of 3dB. Mounting the antenna is simple thanks to the nylon ratchet-mount, and because it is ultra-lightweight, just a little over 2 pounds, allows for additional convenience. Extra features include an adapter plate and a 17 foot RG58A/U coaxial cable with PL-259. 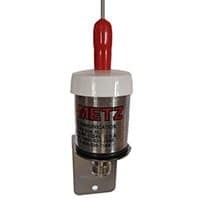 This, coupled with stainless steel components makes it an exceptional and reliable VHF marine radio antenna, and one that will perform for long stretches out at sea. It seems like Shakespeare was as good at writing plays as he was at producing quality marine antennas, as the brand makes another appearance on our list. The Shakespeare 5218 was designed to provide utmost levels of reliability and durability, and has been tested for ease-of-use and efficiency. What makes the Shakespeare 5218 unique is the convenient magnetic mount. This clever feature provides convenience and it guarantees ease-of-use. 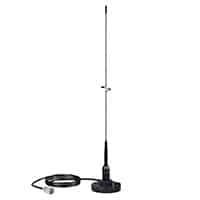 The Shakespeare 5218 has a sufficient length of 19 inches, more than enough to pick up and transmit clear broadcasts, and is suitable for users of all ages and experience. As mentioned earlier, Shakepeare is an outstanding brand, and the 5218 is another antenna that secures its renowned reputation. Some important questions you should ask and features that you need to check in a VHF marine radio antenna are covered in this section. This guide can help you choose the perfect antenna for your VHF radio. The golden rule is that the higher your antenna is above the water, the greater its range. This is primary due to the fact that radio waves on VHF radios travel in a straight line, also known as the line-of﻿﻿﻿-sight. Your antenna must be high enough to take advantage of the line-of-sight. As a general rule, antenna height should be less than half the length of the boat. 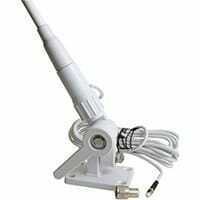 A marine radio antenna should be mounted at least 3 feet away from large metal objects, as well as other antennas. The length of the coaxial cable must also be considered, as longer ones will result in a loss of signal. Take note of the quality, because you can lose significant signal strength if the cable and connections are not up to standard. An antenna's dB rating, also known as antenna gain, is one of the most important factors to consider when selecting your radio antenna. An antenna cannot increase the amount of energy it receives from the radio, but it can manipulate and focus it in specific directions to provide a perceived energy increase. This increase energy is what is called the "gain" and it is measured in decibels, abbreviated as dB. A short antenna usually has a gain of 3dB. This equals a doubling of the signal power. A 6dB gain antenna can increase signal power by 4 times, and a 9dB antenna by 8 times. The type of vessel you use also determines the gain you should choose. The 3 dB gain must always be used for sailboats because of their antenna mast. The 9dB gain antennas should be utilized for land use or on boats with less pitch and roll, so larger boats sailing in calmer waters should go with a 9 dB antenna. Most powerboats should stick to 3 dB or 6 dB antennas. Take into consideration that by law, marine radios are limited to 25 watts of transmitting power. 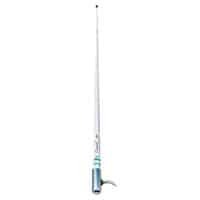 VHF radio antennas are constructed from stainless steel or fiberglass. The life span of an antenna depends mostly on how well you look after it, in addition to the quality. Stainless whip antennas are rugged and commonly used by small powerboats. Fiberglass antennas are not quite as durable and vary in quality. For heavy-duty use where the maximum range and durability are critical, such as on the open sea, polyurethane-coated antennas are recommended. After reading this article, hopefully you understand the importance of a top-notch antenna for marine radios. You are far out at sea and with nothing around you, so never settle for anything less than clear, efficient signals and transmissions. This all starts with the antenna, and now you know exactly which ones are the best, so making your choice shouldn’t be too difficult. Thanks for reading and take care! We've create a buyer's guide that will tell you everything you need to know to buy the best VHF marine radio.